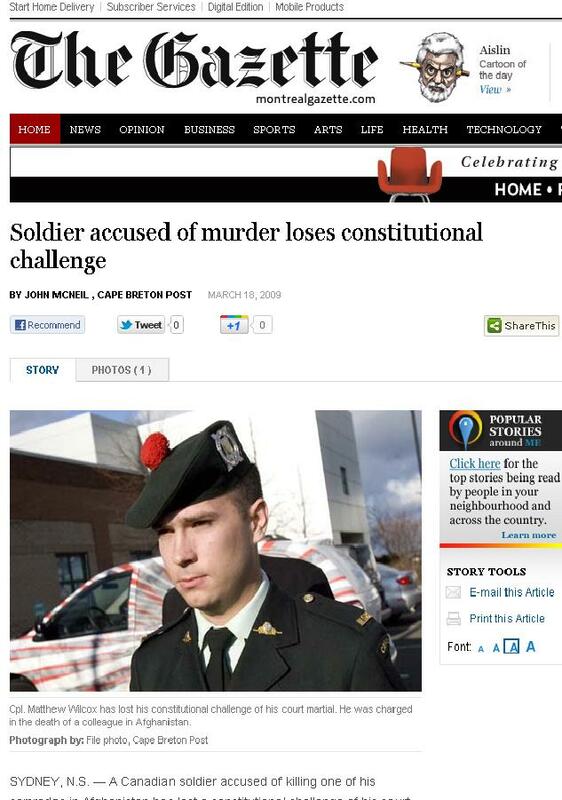 A Canadian soldier accused of killing one of his comrades in Afghanistan has lost a constitutional challenge of his court martial that was raising the spectre of widespread changes to the military justice system. Military judge Cmdr. Peter Lamont delivered his decision Tuesday on a January defence motion that a lack of judicial independence was violating Cpl. Matthew Wilcox’s right to a fair trial. The military judge last month rejected an earlier constitutional challenge to the scale of punishments, ruling it was brought too soon in the proceedings. Now, defence lawyers are continuing with a third challenge, this time to the jury-selection process. Wilcox, 23, of Glace Bay, N.S., is facing charges of manslaughter, criminal negligence causing death, and negligent performance of duty in a general court martial after the shooting death of Cpl. Kevin Megeney in Afghanistan in March 2007. Defence lawyer Maj. Stephen Turner presented arguments Tuesday, claiming the process for selecting the military jury that will hear Wilcox’s court martial violates his constitutional right to a fair trial. Wilcox is a class A reservist, and his lawyers say there is no good reason why class A reservists have been excluded from the panel that will hear his trial. The defence argument follows the earlier testimony of court martial administrator Simone Morrissey, who said at a hearing Feb. 6 that she follows the policy of her predecessors in excluding class A reservists from the military jury selection process. In addition to excluding class A reservists, the defence argued there are arbitrary rules that require different jury compositions, depending on the rank of the accused, resulting in different standards of justice. Military prosecutor Maj. Sherry MacLeod said Turner’s arguments called for broad changes to the military justice system without demonstrating that any of these possible problems will actually affect the Wilcox court martial. The prosecution argued the exclusion of class A reservists is a practical matter, determined by the nature of their terms of employment. Class A reservists have a limited, part-time role, serving up to 12 days at a time for a maximum of 60 days per year, she said. Wilcox’s court martial is scheduled to begin June 1. The defence is seeking a stay of proceedings. Lamont has reserved his decision.